The march of progress moves to the beat of early adopters patting their wallets and chanting, "shut up and take my money." Unfortunately, LG's latest high-end offering can't seem to keep up with its price tag. LG's 2014 flagship UltraHD Smart TV. This LED series comes in 65, 79, and 85-inch varieties, upscales 720 and 1080 resolution into 4K quality, and offers a completely re-imagined input menu with new a motion/voice-controlled Magic Remote. This is supposed to be the future of home entertainment, with a huge panel, integrated streaming sources, inputs, and internet connectivity. And it does most of what it promises, just not cost-effectively. The 80-inch model we tested wasn't so much a television as a wall of moving pictures. This thing was huge. Its angled bar base is visually striking. It runs the length of the set and requires an equally wide television stand if you don't want to wall-mount it. Though, at just under 3.5 inches thick and 74 inches wide, the UB9800 seems purpose built for mounting. There was NO table in my house long enough to hold it so, as you can see here, it just lived on my living room floor atop an old sheet. The set itself is quite nice, with a half-inch matte black bezel running the perimeter of the screen, under a chromed lip plate, with a mount for the $100 optional teleconferencing camera on top. The UB9800 features a number of connectivity options: four HDMI ports (each individually marked for HDCP 2.2, MHL, or 10-bit video inputs), various component and optical hookups, three USB (1 x 3.0, 2 x 2.0) ports, and one PC port. The set also does passive 3D, for the dozen or so of you that actually still use that feature. It also comes with the latest generation of LG's Magic Remote, which works surprisingly well. The Magic Remotes that have come with previous LG test units have been utterly infuriating to use, however this new version is far more stable and responsive. The point and click methodology is also quite handy given that you'll have to adapt to performing most of your command inputs on an on-screen keyboard. There's also a voice command option, though I found it to be rather finicky in what it picks up. Get this thing set up by professionals, I'm not kidding. The entire shipping box weighs over 150 pounds, the TV itself is 132 pounds and overwhelmingly broad. Plus, you can't screw the base on without first taking the unit out of the box, laying it flat on a surface and then mounting the stand, which is a harrowing experience given you can watch the screen flex under its own weight during the process. However, once you get the television situated, the remainder of the setup is a joy. Pairing the Magic Remote to your cable box, logging into streaming services, setting up the Wi-Fi connection, and the rest are all handled by the initial setup routine and guided by an adorable animated penguin. I know it's schlocky, but it really helped to assuage my rage when the system spent 10 minutes looking for my home network. 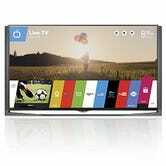 Additionally, this latest new season of LGs all offer the new WebOS Smart TV operating system , which may well be the UB9800's best feature. It ties all of your input options—whether it's a physical component like Blu-ray players, apps like Skype, or streaming services like Netflix and Crunchyroll—to a single selection system in the form of a ribbon spanning the bottom edge of the screen. You can cycle left and right through that ribbon using the Magic Remote to select and instantly switch to any other content source. It's nice to see a flattening of the input choices; is watching content from DVD input really that different from a streaming input these days? I'd argue they're not, I just wish there were any sort of rhyme or reason to the ribbon's layout. Over the course of the four weeks that we had the television, much content was consumed including the Remastered for 4K version of Ghostbusters, It's Always Sunny in Philadelphia on Netflix, the entire first season of Knights of Sidonia, various episodes of House of Cards in 4K on Netflix, more Giants losses than I care to remember, hours upon hours of anime, one complete playthrough of Ninja Gaiden III on the Xbox 360, and a few hours of Battlefield 4 and MLB 2014 on the PS4. Overall, as long as the room was fairly dark and free from glare the picture was better than average; not as good as the Aquos Q+ , but definitely better than what you'd find on LG's less expensive models. Overall though, the size of the set really demands ideal viewing conditions. Otherwise the picture isn't so much immersive as overwhelming. The screen a commendable job minimizing reflections off of its massive display, especially when turned off, though without the fully matte screen off of, say, that Sharp 6 Series we looked at last year, reducing glare is no easy feat. You can boost the set brightness to counter the glare when the TV is on, but that is going to come at the expense of black levels and contrast. This is definitely more of the TV one would find in a dedicated home theater than an average living room. This is an UHD TV living in an HD world. There's precious little native 4K available right now, so the UB9800 must rely on its Tru-Ultra HD Engine to upscale available 1080 and 720 content into 4K, a task that the engine performs very well. The boosted content consistently appears sharp and crisp without artifacts. The set performed spectacularly as a gaming monitor; Battlefield 4 and MLB 2014 seemed nearly lifelike on that ginormous screen. Despite its superlative performance with games, for regular television and movie watching, the UB9800 really fell short in terms of display quality. Colors appeared washed out (and not just compared to the Sharp Q+; the LG's colors appeared dull even compared to my older Sony reference set), the contrast was appalling, and black levels never really got past charcoal grey no matter how much I fiddled with the picture aspects. And LG wants $7,500 for this? I don't think so. You can do better, at least until 4K comes into its own because, at this point, you're still going to be watching a vast majority of your content in regular HD. While the UHD resolution jump is certainly coming, it's just still a bit early to be worrying about whether your next TV will be able to handle 4K content. Your money would be better spent either going towards LG's wicked cool curved OLED set (which, with an MSRP of $9000, actually has a lower MSRP than this set, not counting the healthy discount on Amazon) or going towards a current generation 1080p set like the Sharp Aquos Q+.